A new vision for how the world works? This cruel act of politically motivated violence was not just an affront to our common humanity but a defining moment of our times, just a week before the divisive referendum on Britain’s membership of the European Union and months before the election of Donald Trump. While these events and ongoing war, bloodshed and poverty across the world continue to challenge our shared humanity, they have also showed common humanity burning brightest. No more so than in the actions of my friend and colleague Brendan Cox. He leads our special feature describing the outpouring of goodwill and his resolve to build more inclusive communities at home and abroad in the wake of his wife’s death. 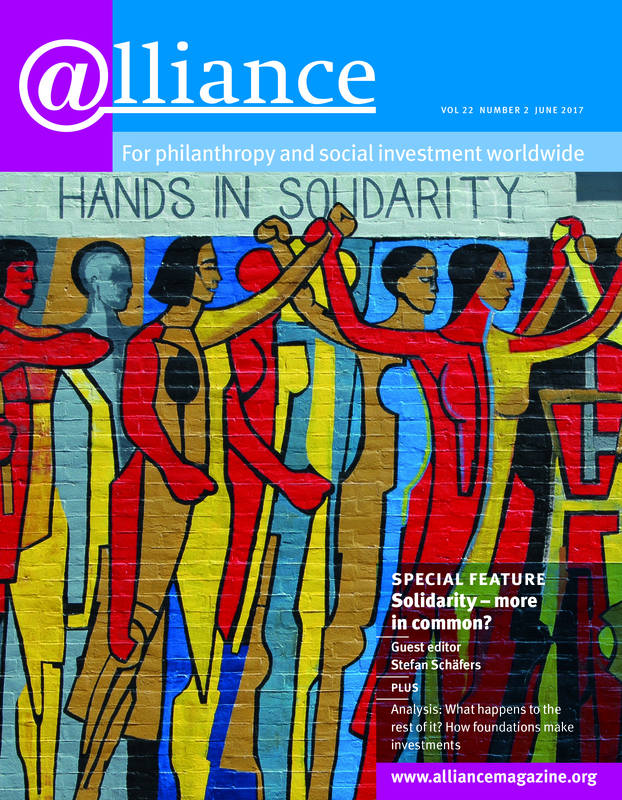 A tempered version of Brendan’s remarkable optimism is reflected in our coverage, which looks at the different ways in which philanthropy is responding to the strains between people and states across Europe. This includes a careful commitment to understanding the challenges through funding polling and gathering data on public attitudes, and bringing people together to find grounds for common action. In a powerful joint statement, foundation associations in the US, Canada, Brazil and the UK come together to write about what they have in common and how they are creating space for their members to navigate the issues of the day. These issues range from integrating refugees in Germany, documented by Bettina Windau, to balancing the needs of newcomers with those of existing communities, some of whom feel left behind, and their way of life under threat, as noted by Janis Emmanouilidis. Most of all, to maintain our shared humanity and common bonds, we must acknowledge that solidarity ‘is used in different contexts, by different people and for different reasons’ and our language of solidarity must adapt to these realities. This is the central theme of the issue, best articulated by our guest editor, the King Baudouin Foundation’s Stefan Schäfers. This issue is dedicated to the family and friends of Jo Cox, and to all those who aspire to live up to philanthropy’s ideal – to love humanity – who continue to show that we have far more in common with each other than things that divide us.